A recent study carried out by Inrix (an American company specialised in road traffic issues) has revealed that Paris is the most congested city in Europe followed by London in second position. The study is based on data provided by the European Office for statistics (Eurostat), which has also been comparing the road traffic situation in six European countries, being France, the United Kingdom, Belgium, Germany, the Netherlands and Luxembourg. 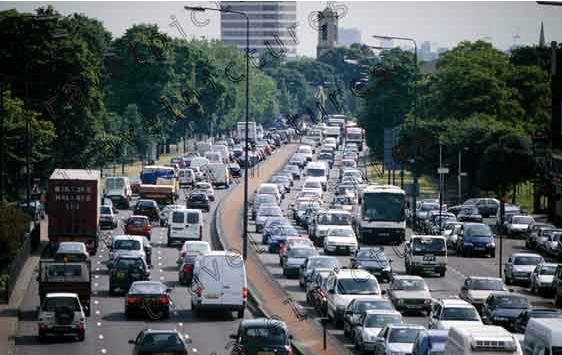 Surely, with London being the largest city in Europe, it comes as no surprise that congestion is a major issue in the British capital, however, one would have easily assumed that London was the first most congested city in Europe, not the second. The congestion charge in London certainly contributes to reduce traffic in the heart of the city and perhaps this is why London is (no longer?) the first most congested city in Europe, as it used to be. What’s actually surprising is that the authorities in Paris and London do not promote the use of motorbikes and scooters as much as they should do if they were truly keen to reduce the negative effects of congestion. While Paris is in the process of creating an additional 2,500 parking spaces for bikes (free of charge of course), traffic filtering or lane splitting (to use the north American terminology) in heavy congestion is prohibited in France because it is considered by the French authorities as dangerous and a major source of road accidents. But surely, if a motorcyclist carefully and responsibly filters through the traffic in between stationary cars, what kind of major accident can he/she cause? To the contrary, thanks to its smaller size and ability to move around in traffic jams, a motorcycle doesn’t cause congestion and, for this reason, its use should be heavily encouraged to help reduce congestion. Motorbikes and scooters are exempt from the congestion charge in London, precisely because they don’t cause congestion, which is another way of encouraging people to switch from four to two wheels and thus reduce congestion. The problem however is that whilst some authorities try their best to encourage the use of motorcycles to reduce congestion, other authorities do exactly the opposite by treating bikers like cash cows or irresponsible citizens who may be dangerous to other road users. In London for instance, whilst the Mayor Boris Johnson has authorised the use of bus lanes by motorcyclists and continue to exempt them from the congestion charge, Westminster City Council has decided to stealth tax bikers to park in a pure attempt to raise revenue and contribute to the growing wealth of their parking contract supplier NSL Services. The result is that, while the Mayor tries everything he possibly can to encourage the use of motorcycles as a golden mode of transport to reduce congestion, a council takes advantage of the growing number of bikes in circulation to fill up its pockets. No wonder why London is still the second most congested city in Europe despite being the only one to tax car drivers to enter the city centre. The issue is quite similar in Paris with its Mayor Bertrand Delanoë trying hard to encourage the use of motorcycles in the French capital by creating 2,500 new parking spaces free of charge, while at the same time, the French Government is continuing to ban traffic filtering or lane splitting to prevent motorised two wheelers to move around in traffic jams. Paris and London are still the two most congested cities in Europe, purely because some authorities try to discourage the use of motorbikes and scooters by treating motorcyclists like cash cows or stupidly forcing them to behave like car drivers, while others offer distinct advantages to citizens who decide to switch to two wheels. No wonder why other large European cities such as Milan, Madrid, Lisbon or Barcelona are a lot less congested than Paris and London. That’s simply because the use of bikes in Milan, Madrid, Lisbon and Barcelona is not restricted in any way. If you’re based in France and want to take part of the fight against the Government’s continued policy to ban motorcyclists from filtering through traffic, then become a member of the Fédération Française des Motards en Colère (FFMC – French Federation of Angry Bikers). If you’re based in the United Kingdom and want to preserve free parking for motorbikes and scooters, then support the No To Bike Parking Tax campaign now before you end up paying to park your bike outside your home or office.